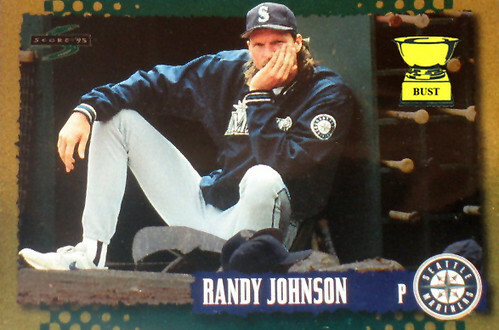 Randy Johnson's train of thought from 3:10 to 3:12 p.m., March 24, 1995: "Sigh. It's just not fair. Why do the guys always have to hold a limbo contest before practice starts? I can't bend that far heck, my knees are taller that the starting point! Sigh. It sure does look like a lot of fun, though. Plus, the winner gets a Tupperware full of Griffey's jerk chicken and a bag of Buhner's finest Jamaican reefer. I like those things. Siiiigh. I guess I'll just sit over here by the bat rack and smell my mullet for a little while. Hmm, is that mustard? Mmm, Dijon! I remember that sandwich. Oh, man. Now I'm hungry. Sigh. Guess I'll just lick my palm until they're done."